The beautiful city of Liverpool may be best known for the Beatles, the Liver Birds and football, but there is so much more to it. 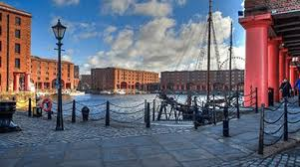 With fabulous 19th century architecture mixed with stylish modern developments, the city has benefited from extensive regeneration and investment to its docks, the wider city and surrounding areas. This vibrant and eclectic city is experiencing something of a renaissance and now also boasts a wide variety of fabulous dining and party venues with private rooms and event spaces… and more are popping up all the time. One to watch is Grand Central, with its multiple food outlets and plans to host weddings in the near future. For now check out these already fully functioning function spaces.. Located on Berry Street, at the corner of the city’s Chinatown district, Chamber 36 offers private dining and event spaces in wonderfully atmospheric surrounds, complimented by irresistible oriental street food, from Chinese Dim Sum, to the best Thai dishes and delicacies from Japan and Korea which can all also be offered in a buffet style or as canapes. Ideal for parties, it’s also a great venue for hosting networking events or corporate hospitality. Our top tip – they offer wine and liquor tastings on request. 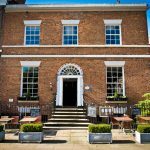 Situated on Hope Street and sister to the renowned Hope Street Hotel, this multi-award winning restaurant offers a wonderful opportunity for private events, parties and meetings for up to 120 guests as well as weddings with several rooms that are fully licensed. 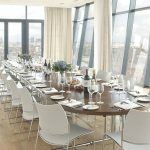 With highly flexible spaces, the fifth floor offers a private terrace and breath-taking views of the city and can host up to 60 guests, while the old Bookroom provides a smaller, more intimate space. Special day rates are available from £35 per person, while 24 hour rates start from £165. Watch this space – a new events space is planned for June 2019 for up to 110 for private dining. 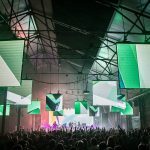 For larger events, this unique venue can host up to 860 standing or 200 in a banquet style in the Camp warehouse, while Furnace can accommodate a whopping 1200 standing or 300 banquet style. It’s an extraordinary and unique space that offers fabulous flexibility. There’s the opportunity for hosting stage and live music events as well as black out blinds and the option of a 4am curfew. 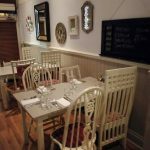 This family-run, modern European local restaurant, is a favourite of locals in the know and can be booked exclusively for parties of up to 34. With stunning food from the experienced chef patron, parties can arrange for a bespoke menu or pick a single menu from the current dishes available. Top tip – in the week, the meal deal is a steal at £17.95 per person for two courses. There’s a carefully curated international wine list and all dietary requirements including vegan, veggie and gluten free can be catered for. This stunning Georgian Townhouse offers a private room on the first floor for up to 30 guests on one table or 45 on five tables of 9. Designed in neutral colours with plenty of natural daylight, it’s a versatile and flexible space that makes a great venue for weddings or civil ceremonies as well as party entertaining. Guests can enjoy the award-winning modern British menu, with prices starting at £29.95 for three courses. There is a room hire of £200 but no minimum spend. The Hay Loft within the grounds of Allerton Manor Golf Club, can host 80 for a seated event or 120 for a standing function. Handily located just a few minutes’ drive from Liverpool John Lennon Airport and Liverpool City Centre, this stunning Grade II listed building boasts original oak beams, a real fireplace and arched window, as well as more modern features and also offers a private bar (with 1am license) & terrace for guests to soak up the beautiful grounds. 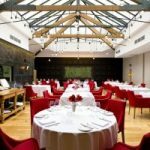 The contemporary British menu starts at £25 a head for three courses. From its humble beginnings as a fish n’ chippie, George’s now boasts four restaurants, and its Liverpool site was voted one of the city’s top 3 places to eat in 2018. The back area of the restaurant can be hired as a semi-private exclusive space for up to 70 guests and includes six of their iconic beach hut booths. 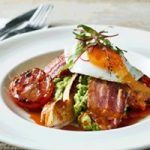 Main course menus range from £11.50-£20 per person and include classics like fish n’ chips as well as twists on British favourites like a English breakfast pie and a winner-winner-chicken-dinner pie. There are plans to expand their function offer in 2019 so watch this space. 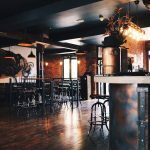 Heralding the rejuvenation of Wolstenholme Square, Clockworks is open for breakfast, brunch, lunch and dinner, and offers private hire of the Bar area for up to 40 guests or the Dining area for up to 50 guests or exclusive hire of the whole venue. 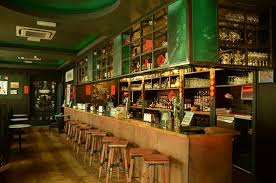 With an interior that reflects its 200 year history featuring exposed red bricks, steel and iron, the venue also boasts a late license and cosy cocktail bar. Food at this independent restaurant is made from scratch, traceable, indulgent and specialises in British classics with a twist, and they are also happy to arrange drinks receptions. With five private dining rooms hosting from 8 to 80 guests, this lavishly styled hotel on the banks of the Mersey is a real favourite for all manner of events. For intimate dining with views of the chefs at work, The Kitchen seats an intimate 8, while for larger parties Mal One, Two and Three can be used individually for 20 or 40 or together for up to 80. The brand’s classic modern European style menus start at around £30 per person and with 130 bedrooms, it’s a great place for events when guests also need a place to stay the night. This atmospheric venue in the heart of Liverpool’s commercial district on Brunswick Street offers a private room for 18 that is ideal for both corporate dining and personal entertaining. 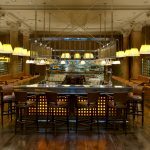 Open for brunch, lunch and dinner, the private room in the former old banking hall is located at the front of the building allowing for easy and discrete access for guests. With Modern European menus focussing on ingredient provenance and starting at £35 per person, it’s worth noting the bar also offers a fabulous range of cocktails. The multi-award-winning Art School Restaurant opened in September 2014 and now offers four private areas for hire. The Lantern Room is available to hire exclusively for between 30 – 54 guests and chef patron Paul Askew can develop special menus for these occasions or there are also tasting menus to choose from. The stunning Moriarty Private Dining Room can host up to 28 guests and is served by its own dedicated private kitchen and bar as well as its own washrooms, allowing for parties to have discretion. In addition, The Spanish pinxos-inspired Cellars are available for private use and can host up to 60 guests for standing receptions with canapes, small plates, and Charcuterie platters available. For more intimate gatherings the Private Tasting Room can accommodate up to 10 guests and is ideal for discrete corporate entertaining and gastronomic dining.